At Ability, we know there is a lot going on, and it can feel like a polarizing time for many of us. That’s just one of the reasons why yesterday was such a special demonstration of how we are able to come together as a team and give back to those in need! It was an honor seeing so many students spend their day off from school honoring MLK day by giving back to their community! ROMP Global, Ability Prosthetics and Orthotics, and USciences teamed up to disassemble donated prostheses to help those in need. If you’ve been following us for a while, you’ll know this disassembly event is something ROMP and Ability do frequently, but this may have been one of the most special yet. 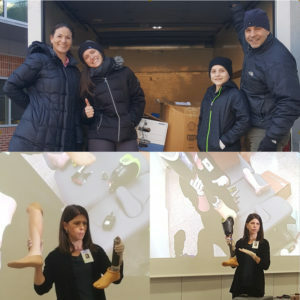 Reggie Showers, an inspiring amputee, joined the volunteers to take apart the devices so that components could be donated to ROMP to use for those who otherwise wouldn’t be able to obtain the prostheses they need. These volunteers took those words to heart and worked for others yesterday. And they even enjoyed it! We’re feeling pretty cool at Ability being featured in so many Insta Stories!